Productivity and the Getting Things Done (GTD) methodology isn’t limited to the smartphone realm, but it’s certainly a playground for app developers to share their own interpretations of the system. 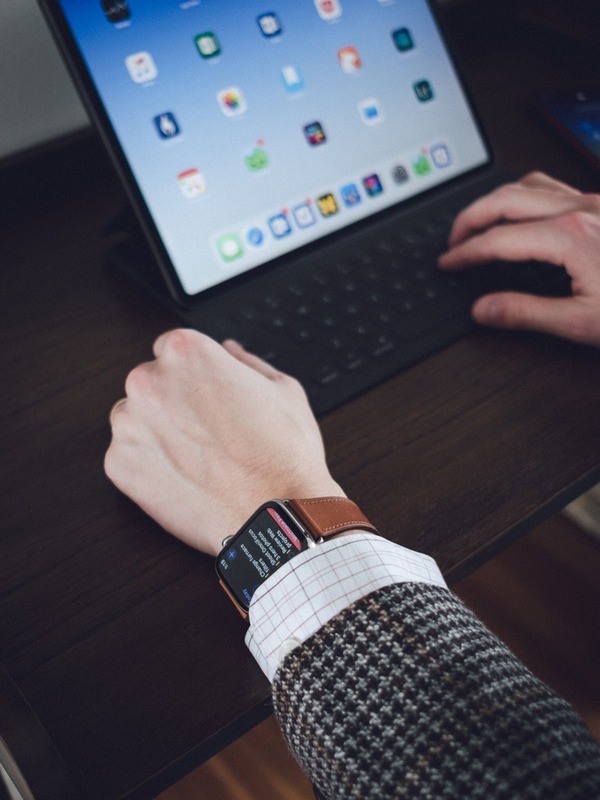 While we have a detailed review dedicated to the best suite of GTD tools for your Mac and iOS devices, there are still times when you want access to your GTD system from your wrist. After testing over a dozen todo apps, it became very clear that no other app is able to do as much as Things on the Apple Watch. As a bonus, Things is lovingly designed with an easy to use, delightful user interface, as well as a genuine attempt by the developers to fully take advantage of the watchOS platform in almost every way possible. Task management is a very personal thing, so while Things is our pick for the best Apple Watch task manager, it still may not be exactly right for you. To that end, we’ve included an excellent runner up in Todoist, as well as a few other close contenders that excel in specific areas. With that said, let’s jump into Things for the Apple Watch and see what makes it special, and why it’s worth every penny. I have been steeped in the GTD community since the dawn of the App Store and have been using all of these apps for years. If I checked my App Store receipts, I’d probably be shocked by how much money I have spent on these apps over the years to make sure I’m keeping up with what is new and important in the ecosystem. 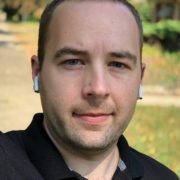 I have my own personal feelings on what apps work best for me, and that of course influences my conclusions, but having talked to many people and learning what they like and dislike about their task mangers has helped me look beyond my own preferences and find the best apps for the most people. I spent several weeks using all of these apps, moving my personal todos from one app to the other every few days. I was looking for the apps that made me want to keep using them after switching to something else. This review doesn’t touch much on the iOS parts of these apps and is really all about the watchOS side of things. Useful notifications that make it easy to mark things done or save them for later. Complication support so you can see what’s going on and get to the app easily. 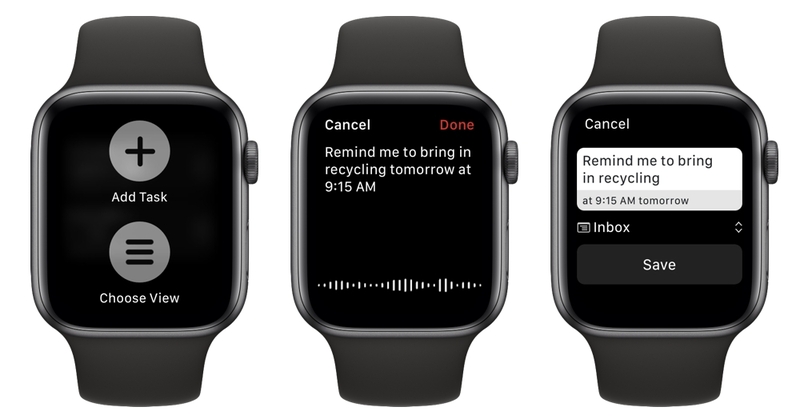 The ability to add tasks from the watch app and not pull out your phone. Easy-to-use interface that optimizes for speed since nothing matters as much on the Apple Watch as getting your information and letting you act on it quickly. Things has useful notifications that do enough for most people. When a notification comes in, you can either snooze it for 15 minutes or mark it as done. This isn’t best in class, and I’d love the ability to add more options, but it’s completely serviceable. One part of this that makes Things stand out for me is that when you mark a task done from the notification, it updates the app on your phone and all your other devices with Things running on them almost immediately. This is super important to me since I tend to have things I actually expect to get done today in my task manager, and seeing that number tick down reliably throughout the day is essential. Many other apps we tested didn’t update things until you opened the app on your iPhone, which at that point makes you feel like you’re not getting the most out of the Apple Watch. One thing that Things doesn’t do as well as some other options we tested is customizing what actions you can take on notifications. For example, 2Do lets you snooze notifications for 15 minutes, 1 hour, or push them to the same time tomorrow. I particularly like the “tomorrow” option as sometimes there are things where I just know I won’t be able to do them today and want to pick them up the next day. That’s super convenient and I hope Things adds it in the future. Also, it’s a small thing, but we like that Things uses watchOS’s relatively new dynamic notifications to show your task in a notification that looks very much like Things and not the generic black notification background that basically every other task manager uses. It doesn’t really matter, but it’s a nice touch and is an example of the developer showing they are intent on supporting the Apple Watch in every way possible. 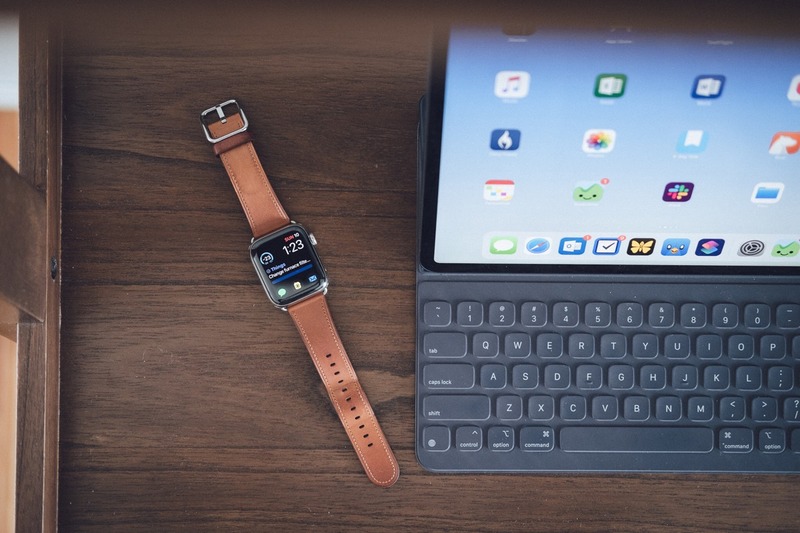 Complications might be the most important aspect of an Apple Watch app’s success, and task managers have largely done an excellent job with this for years, and most have even added support for the new complication types on the Series 4 Apple Watch that came out last fall. Still, Things stands head and shoulders above the rest of the page here. Not only does Things support all the old and new Apple Watch faces, but it’s the only task manager I’ve found that supports every single complication type. So wherever you want Things to show up on your watch, Things has you covered. This is especially notable on the new Series 4 Infograph and Infograph Modular watch faces which have a bunch of different designs to support. The general idea of the Things complication is to show the task that’s due next, as well as how close you are to completing all of your tasks for the day. Take the Infograph Modular watch face as an example. 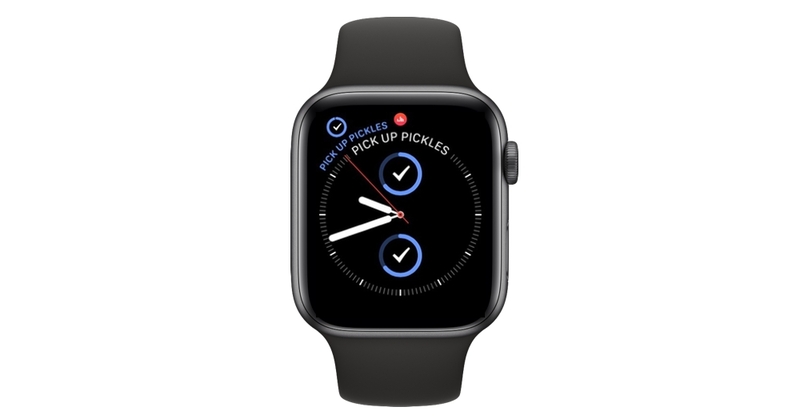 Things uses the large center space to show you the name of your next task (I can’t forget to get those pickles!) and a progress bar for how far along I am in getting everything done for the day. The bottom middle complication is also Things and omits the task name and leaves the progress bar. Moving onto the more complex regular Infograph watch face, Things also fares quite well. The corner style complication shows the next due task, the top dial one delightfully shows the next task as well as a circular progress bar, and the inner bottom dial one just shows your progress for the day. Personally, I find it frustrating when an app supports some complications but not others since it forces me to arrange my watch faces in certain ways instead of giving me the freedom to sort things how I’d like. Things gets top marks for letting me use it however I want on whatever watch face I’m using today. Oh yeah, and Things supports the Siri watch face, so your tasks will pop up in your stream throughout the day. 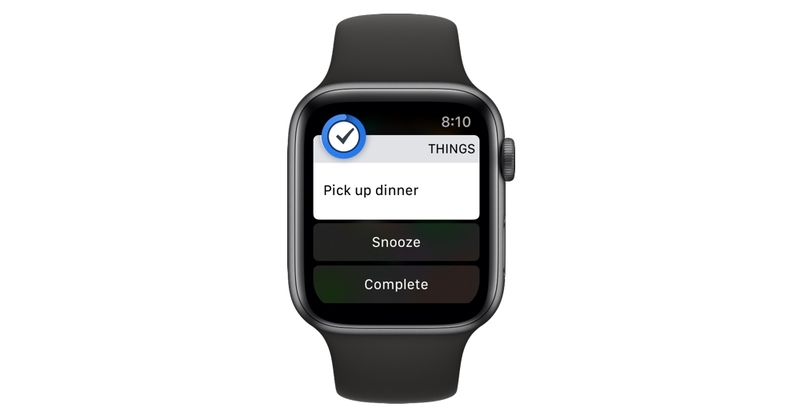 Things allows you to create new tasks from your wrist, and it’s pretty simple to do. Just open the app on the watch (probably from the complication of your choice) and tap the blue “plus” icon. You can dictate your task and it will be added to your inbox. Just like notifications, this just works and I was reliably able to add tasks and know that they were in my inbox to manage later. I really like that Things has a visible button on the main app screen to add new tasks. This is unlike most other task managers which hide this function behind a “force press” on the screen. While that works, it’s an extra step and is simply not as discoverable to many people. Force pressing gives apps access to more interactions than standard touch controls, but it’s really something you should only have to use to do for secondary tasks, not core app functionality. By bringing this to the front of the user interface, Things gets me to use it more to add tasks than some other apps. There are three things we would really love to see added here, though. 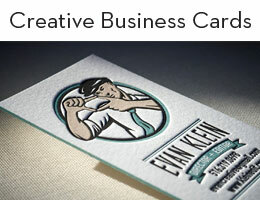 First is the ability to use smart parsing to allow for adding tasks with due dates and times. For example, I’d like to be able to say “Take out the garbage at tomorrow at 9PM,” and have a task called “Take out the garbage” with a due date of tomorrow at 9PM. Instead, Things will make a task with the name “Take out the garbage at tomorrow at 9PM” and it will have no due date. Todoist is the only Apple Watch app that we can find that does this and it’s wonderful. I’d also like to see a new complication added that takes me straight into making a new task. That way I can cut out another tap when I want to add something. 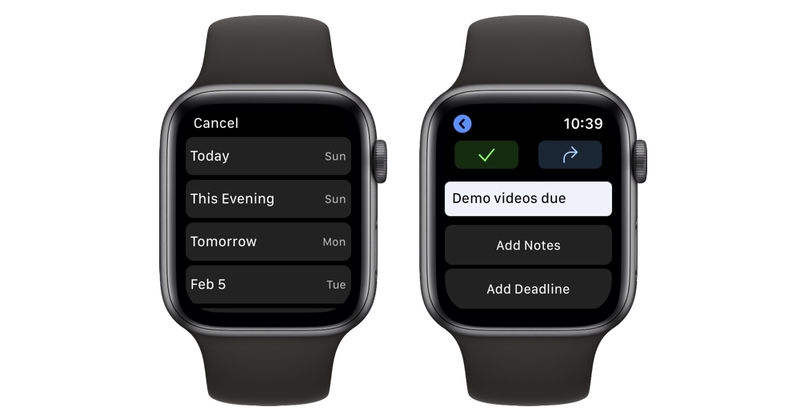 One of the core ideas of GTD is in reducing friction to getting things out of your head and capturing them somewhere, and turning your Apple Watch into a one-tap capture device would be awesome. Finally, if I can’t add due dates to tasks, I’d at least like the option to add them to somewhere besides the inbox. A simple setting like “all new tasks from the Apple Watch go into my Today list” would be great for me. It’s cool that we can talk this much about an Apple Watch app for this long before getting to the app itself, but that is the nature of watchOS. Great apps are much more than the app themselves, and the less you need to go into an app, the better that app is doing. The current version of watchOS limits developers a good amount in terms of what they can show, but Things does its best to make a UI that looks like their own and not just a generic list of tasks on a black background. For example, the checkboxes on tasks use the iOS app’s distinct shape and animate nicely when you tap them. Tasks flash with a custom animation and then bounce off screen. The number of completed tasks for the day also flips up to the next number in a very satisfying way. Moreover, tapping into an existing task brings up some custom buttons for marking complete or deferring for later. These animate into view in a way that I get a kick out of every time. Odds are that you won’t spend much time in the app, but this is a first class Apple Watch app experience. If we expand the conversation to talk about the best Apple Watch apps of any type, Things is still right up there with the best third-party apps out there. It’s just fantastic. Like I said at the beginning, task managers are really personal, and what is important to one person may not be as important to someone else. While we think Things will make the most people happy, it’s not the absolute best at everything. To that end, Todoist excels in a few ways that make it stand out from the crowd as well. The one thing Todoist does better than any other app we tested was adding new tasks. It theoretically does this the same as other apps where you dictate a task and it adds it to your inbox, but it breaks free from the pack by letting you add due dates, times, and projects at the same time. So while Things just lets me add a task and then I need to go to my iPhone to give it more details and a due date, Todoist lets me make tasks that have all of information there right away. Using the same example as above, saying “Take out the garbage at tomorrow at 9PM,” to Todoist will make a task called “Take out the garbage” and it will be due at 9PM tomorrow. That’s exactly what I want from a task manager and it’s pure magic. This was also a feature in Fantastical for watchOS, our pick for the best calendar app for the Apple Watch. This makes you feel incredibly empowered when making tasks and means you don’t need to get your iPhone involved at all. The Todoist app is very similar to what Things has going on, but it steps it up a little with the option to customize what tasks you see when opening the app. It defaults to today only, which is the same as Things, but you can press into the screen to change the view to the inbox, the next 7 days, and even specific projects/filters/labels you have set up. This is really nice and I like to use it in the 7 days view so I can get a preview of what I have coming up tomorrow while in the app. The app itself is not quite as fast as the Things app, and it feels a little less refined. For example, when you mark a task complete, the task gets checked off and then the check disappears for a second or two before the task disappears from the list. Also, I’ve had a few times where I dictated a task and the app just hung for a while and never added the task. I was never able to figure out why it didn’t work, but it happened a few times in testing. If neither Things or Todoist get it done for you, there are plenty of other options out there, and here are our favorites. TickTick is a popular task manager, and it’s been making waves in the productivity community in recent years. They are also a very good watchOS citizen, with an easy-to-use watch app. They support all complications, even the latest Series 4 ones, and like Things, they often show a progress bar in those complications so you know how close you are to completing all your tasks for the day. 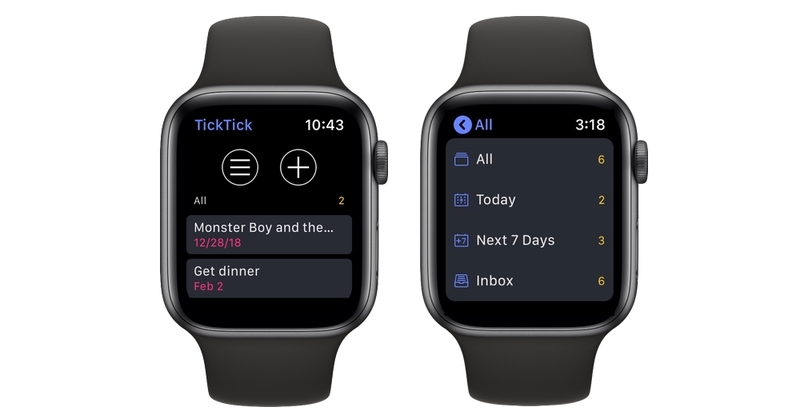 The only slightly negative thing we can say about TickTick is that you need to have an account with them to use the Apple Watch app. If you don’t have an account, then the app simply won’t function. OmniFocus is a reliably excellent task manager for iOS, and its Apple Watch app is also quite excellent. 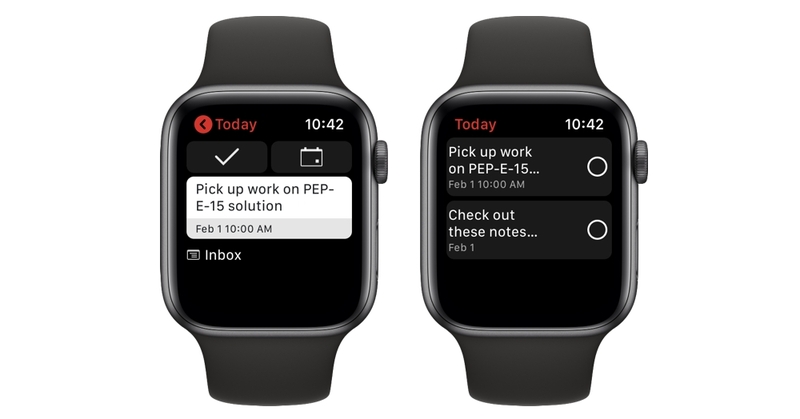 A lot of people have a long history with OmniFocus as it moved from the Mac to the iPhone and then to the iPad, and we’re happy to report that The Omni Group have created an Apple Watch app that lives up to their storied history on Apple platforms. The app itself is what sets OmniFocus apart from the rest of the pack. Like Things, OmniFocus has designed their app to look precisely like OmniFocus on your phone. It’s a good look, and I think the app is all the better for it. The home screen lets you see a surprising amount of data at once, and your next task always shows at the bottom so you can mark it off quickly. You can then go into a bunch of different views, including what’s due today, due soon, past due, flagged, or just in your inbox. 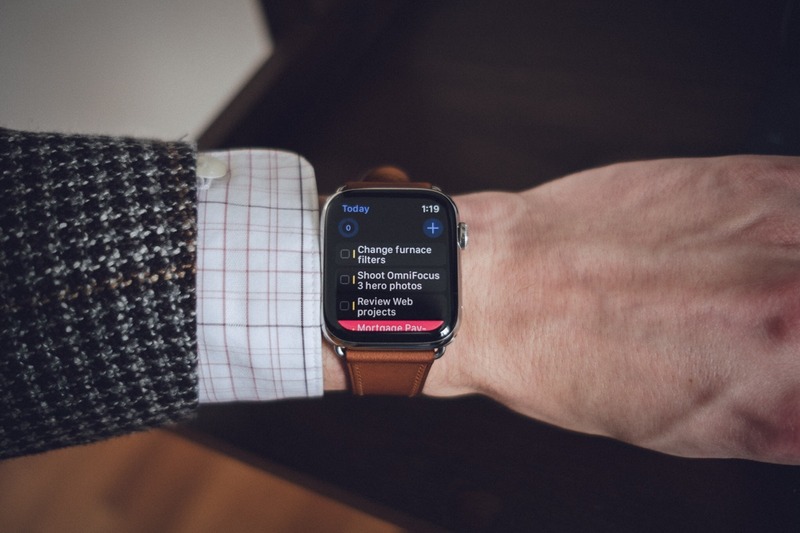 The best part of this view is that it really acts like more of a full OmniFocus replacement on your wrist. You can just see so much that you almost never need to go back to your phone to find a task you’re hunting down. OmniFocus falters a little when it comes to other watch actions though. Notifications are standard fare, with only options to snooze 15 minutes or mark complete, and while they have added support for Series 4 watch complications, they don’t do much with them. GoodTask is a task manager that uses Apple’s Reminders app as a back end, and it’s kind of genius. You don’t get quite as much power as some other apps on this list, but the seamless integration with Reminders has a serious appeal to lots of people. And hey, if you ever get tired of GoodTask, all your task history is stored in Apple Reminders, so nothing will be lost. Oh, and GoodTask wins in terms of snoozing options, letting you choose between 10-, 30-, 60-minute snoozes, as well as delaying until tomorrow. There is also the old standby, Remember the Milk. This app has been around since almost the beginning of iOS, and it’s frankly better than most people think it is. The same holds true of their Apple Watch app, which supports robust views for what’s due today, tomorrow, and any custom views you have set up. It also supports all complications on new and old watches. The big hurdle for this one is that you must have a pro subscription to use the watch app at all, which is $39.99 per year. That’s a steep price to pay, but if you love the iOS app (or the Android, Mac, Windows, Linux, web, or even Blackberry versions), then you probably already have this. If you are not already a fan though, make sure you like the main app before dropping the much money on a subscription for this one. The watch app is one of the best out there, but it’s not the absolute best. As long time iOS users, it’s so satisfying to see Cultured Code’s Things on the top of this list. Something has changed over there in the past couple years as the app has changed from something that got updated once every 2 or 3 years and is now one of the most reliable cutting-edge apps on all of Apple’s platforms, including the Apple Watch. Testing a bunch of task managers for this comparison made us realize that the state of task managers on the Apple Watch is currently very good. Even if Things is not your cup of tea, Todoist is a fantastic alternative that excels in different ways, and TickTick, OmniFocus, Goodtask, and Remember the Milk could all be your personal favorite. While other app categories may have one or two decent options on the watch, task managers are a general smorgasbord of great choices. 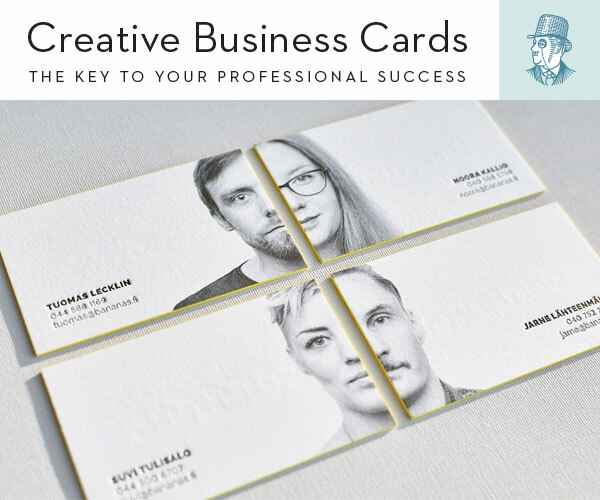 Matt is a product designer by day and a tech enthusiast by night. He lives in the Midwest with his wife, Beth. You can usually find him writing and podcasting about all things tech at BirchTree.